WAUKEGAN, Ill. (June 17, 2016) – Precision Laboratories announces a new product specifically designed for the applicator who wants to optimize the performance of dicamba-based herbicides to fight weed resistance. 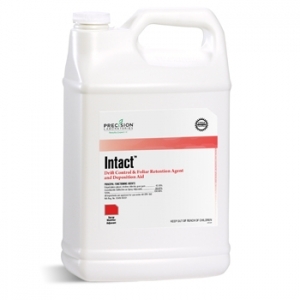 IntactTM is a foliar retention agent and deposition aid with an optimized formulation of proven HPG (hydroxypropyl guar) polymer technology that maximizes drift control for a wide range of crop protection products – ensuring large droplets are retained on the target leaf surface for better coverage, uptake potential and herbicide performance. Waukegan, Illinois (August 17, 2012) – Leading the agriculture industry with innovative, sensible and effective solutions, Precision Laboratories introduced new adjuvant technology designed to improve spray droplet adhesion on the leaf and reduce drift. Waukegan, Illinois (November 8, 2012) – Aerial applicators now have an on-target solution when delivering timely and more precise applications of crop protection products. Precision Laboratories, a leading provider of specialized chemistries, recently introduced Volare DC™, a new adjuvant technology for aerial applicators.